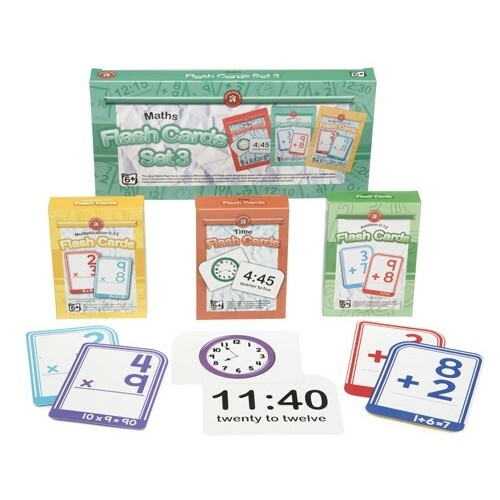 This set of Maths Flash Cards includes 3 different packs of 65 Flash Cards designed to assist children to learn and memorise addition facts 1-12, multiplication facts 1-12 and time. Self-checking format allows children to work independently. Each laminated card can be used with write-on/ wipe-off whiteboard markers. Flash Cards have rounded edges for easy sorting and each measure 87mm x 123mm. Detailed activity guides in each pack. Set includes: Addition 0-12 Flash Cards, Time Flash Cards, Multiplication 0-12 Flash Cards.